As with most major news events, there’s now a slew of conspiracy theories about Robin Williams’ death. 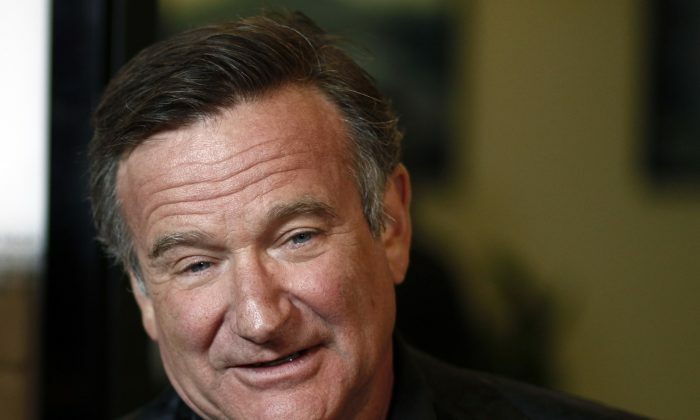 According to the Marin County sheriff’s office in Northern California, Williams died after committing suicide. His body was discovered on Monday, and a forensics and toxicology reports are pending. TMZ said that committed suicide himself by hanging himself with a belt after attempting to slash his wrists. One theory that was getting shared heavily on social media sites was from conspiracy website Before It’s News. “With the very sad, just announced passing of comedian Robin Williams, ‘conspiracy theorists’ have already jumped on the ‘Robin Williams was sacrificed by the illuminati’ bandwagon as shared by Mark Dice in the brand new video below. Was Robin Williams an ‘illuminati sacrifice’ or another sad story of a wonderful actor whose life has gone awry?” it says. Another one claims that the Fox TV series “Family Guy” was involved. The BBC broadcast an episode of “Viewer Mail #2” on Monday just minutes before Williams’ death was announced. “A sketch in the episode called ‘Fatman and Robin’ sees Peter Griffin, the father in the US comedy, gain the power to turn everyone in his fictional city of Quahog into Williams by touching them,” says the Daily Mail. Some Twitter users said the fact that the program was aired right before his death was announced is a sign of a conspiracy. Others said that his death was “predicted” or that he was still alive. On Twitter, a number of people theorized that Williams was murdered. “The illuminati murdered robin williams and made it look like it was suicide,” one person wrote on Tuesday. Following major news events, there’s usually a great deal of websites and blogs that post conspiracy theories about the reasons why. This year, both Malaysia Airlines crashes were the focus of many, including UFO abductions. And when Paul Walker–the “Fast & Furious” actor–died last November, many said that he was murdered or was still alive in the days and weeks after he died.